My amazing GSD, Schultz, R.I.P. 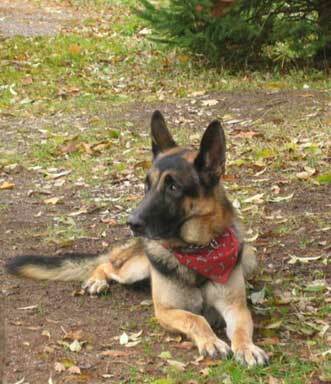 This was my GSD Schultz, He was 8 yrs old and was my pride and joy!! I lost him on December 10th 2010 very unexpectedly. He had become sick, wasnt eating right and just acted like he didnt feel well, I had taken him into the Vet and found out that he had a very large abdominal tumor, that was cancerous and had taken him very rapidly. He was a large gsd weighing about 110lbs at his good weight, he had lost 35lbs in a matter of 3 days. So, I had to make the very hard decision to let him go, I miss him terribly. He was an amazing dog, my protector and loved my kids very much. Schultz had been shown a few times and had taken his class every time, never got any points but I didnt care. He loved doing it and thats all that mattered to me! He sired 2 litters in his lifetime, that turned out just as amazing as he was. I had him from the time he was 5 weeks old, he was being hand raised thats why I took him, and continued to raise him myself from that point on. He lived a long, healthy, and happy life until the cancer took him. Schultz was a good dog, he loved helping to raise the puppies and herded my kids when they werent listening. There will never be another that could ever take the place of him, he truly was one of a kind!! Thank you for reading my story, and I wish you luck and health in all of your GSD's!! Truly is the most amazing breed that there is!! Dear Misty, thank you so much for taking the time to share your wonderful story about your German Shepherd Schultz, with us here at Total German Shepherd. Let me say right up front that I am so very sorry for your loss - it is a shame you didn’t get the chance to have more time together with Schultz. Comments for My amazing GSD, Schultz, R.I.P.